The Milwaukee Bucks now have both of their 2012 draft picks in the fold. After signing 1st round pick John Henson (North Carolina) earlier this week, the team announced the signing of 2nd round pick Doran Lamb, the 42nd overall pick in the draft, to a multi-year deal. Lamb played two seasons at Kentucky, averaging 13.1 points in 78 career games. He leaves Kentucky as the top three-point shooter in program history, connecting on 47.5% of his attempts from behind the arc. Lamb also joined the 1,000-point club in Kentucky’s win over Kansas in the 2012 National Championship game when he scored a team-high 22 points. 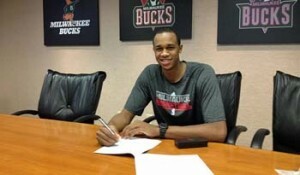 Lamb will play for the Bucks in the 2012 NBA Summer League in Las Vegas. That team will start play Monday against New Orleans. Henson was the 14th pick by the Bucks in the June draft. Henson is working out with teammates in Milwaukee, in preparation for the NBA Summer League in Las Vegas. The Bucks will begin play there on Monday against New Orleans. The 6’11 Henson played at North Carolina for three seasons. He averaged 13.7 points and 8.1 rebounds a game last season, earning his second ACC Defensive Player of the Year Award. Henson is expected to receive $1.8 million in the first year of the deal and nearly $4 million in guaranteed money over his first two seasons. The Bucks are also expected to have their second-round pick, Doron Lamb of Kentuck, under contract before summer league play begins next week.